Two-tone lime / yellow and orange military style BDU jacket with 2" 3M™ Scotchlite™ Reflective Material sewn-on trim. Covered button-up front, 2 large chest pockets with button-down flaps, adjustable cuff straps. When worn with AV-HVP-300 ANSI Class E BDU Pant, the entire uniform meets ANSI Class 3 standards. Ideal for safety service patrols, highway workers, tow truck operators, airport and railway workers. 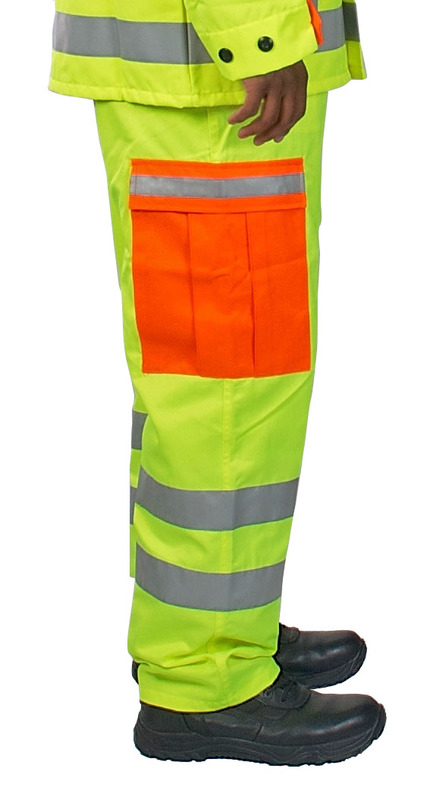 Two-tone lime / yellow and orange military style BDU pant with 2" 3M™ Scotchlite™ Reflective Material sewn-on trim. Heavy duty zipper fly, 2 side pockets, 2 back hip pockets with button-down flaps, 2 large thigh cargo pockets with button-down flaps, adjustable waist straps, and extra strength belt loops. When worn with AV-HVJ-300 ANSI Class 3 BDU Jacket, the entire uniform meets ANSI Class 3 standards. Ideal for safety service patrols, highway workers, tow truck operators, airport and railway workers.